Ideal for both urban and off-trail adventures, the all-new ZERØGRAND All-Terrain Waterproof Sneaker brings an explorer-level of performance and waterproofed winter comfort. Seam-sealed, water-repellent materials ensure all-weather dryness, and a robust lug outsole provides excellent traction and durability. Full rubber outsole with concealed Grand.ØS technology for ultimate comfort. Perfect! Yes very perfect I own 15 of them. I love the shoes it’s just a little big than my same size Cole Hann shoes I’ve bought in the past. Good casual option. It’s comfortable looks good and I like that is water proof. The look is perfect for a business casual attire. It only needed a little of break-in but aside from that it’s perfect. The shoes are nice and appealing to others as I’m complemented on whenever I wear them. Snug fit but durable when raining. Great shoe for the price. Great shoe, everyone likes them. Amazing shoe, I get compliments on the regular. This is on eof my favorite shoes right now. Its perfect for winter, waterproof amd great traction. Cole Haan is killing it right now. It is not always easy to find shoes that can weather the cold and wet weather while remaining stylish and comfortable. But this shoe does with flying colors. The sole can handle the roughest NY streets, while the inner sole keeps you very comfortable for miles of walking. Although they are true to size, they are a bit tight to put on, especially at first wear. However, the feel and look are incredible. Excellent boot. Feels great on your feet all day long, very comfortable. Purchased 2 of these boots in different colors because I loved them all. The shoe fits greats. It gives superior support and its cushioned bottom makes walking a pleasure. It is a sturdy shoe that could be worn with slacks or jeans. I look forward to its traction this winter. It also makes you about an inch taller. I had purchased this particular style in women’s for my Sister’s Birthday, and she can’t stop talking about how comfortable it is therefore I’m buying one for myself to find out. I like the style. Great shoe. I was looking for a shoe that was warm, stylish, and had the innovative sole I needed for my back issues. I tried these on in the store before I purchased them online and found them to be great! 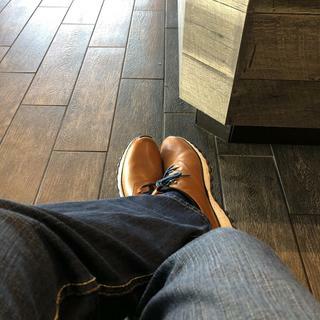 Looking for a shoe that looked nice, was passable in a somewhat casual work environment, and would be able to make it through Portland, OR fall, winter, and maybe spring. Comfort and Support. Waterproof.Good quality and nice looking shoe. I needed waterproof shoes which were stylish to wear in our upcoming European trip yet comfortable because we will be walking a lot! I got the boots a couple of days ago but when I saw this, it was a great alternative! Is this shoe breathable enough to be worn during hot summer days too? BEST ANSWER: Living in Florida I can say that I would not wear this shoe on a 90+ day or an 80+ day if I was going to be outdoors for extended periods of time. I have worn them to the office on days in the low 80's and they are fine as long as you are in the A/C most of the day. A few of the answers talk about the liner and that helping but that liner is made of Neoprene which is not breathable. The liner is also solid which is how the shoe is waterproof but this means there is no way to get airflow into the shoe. 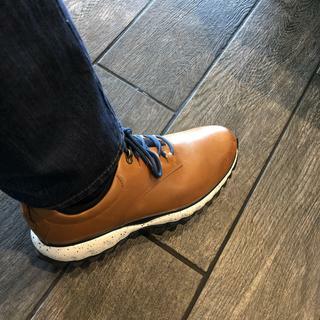 I love these shoes, they are super comfortable and I would purchase them again but I will be putting them away for next winter once the weather start to warm up. I'll answer this as best I can. I bought them in order to have a fashionable shoe to wear on the rugged streets of New York. However, I took them to South Florida and wore them in 80 degree weather without my foot getting too hot. Because they are waterproof, you're not going to get breathability from the outward leather. However, there is a breathable non-removable inner sock that keeps your feet quite comfortable. This is a very comfortable, ingeniously designed shoe, in my opinion. Do not wear on hot days. Only fall and winter wear. It’s more like a boot. 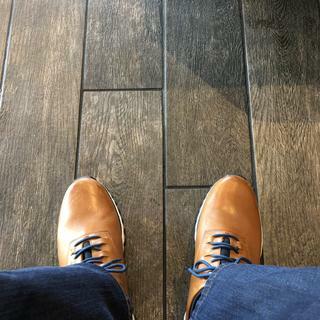 I have over 10 pair of Cole Haan shoes and a 9.5 in all. 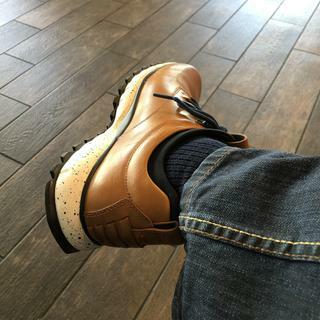 I bought the GrandExplore AllTerrain woen sneaker in a 9.5 and it was way too big. Does this shoe fit like a true 9.5 or is it much bigger than their usual sizing? This specific sneaker runs big for some reason. I bought it too, ended up returning it. Good quality sneaker, especially the built-in sock sleeve. Go a full size down, or a half size at least for a fit you’re used to. Is the shoe difficult to get on and off? With the making of the show how the tongue is not separate from the sides, it looks like it might be difficult sliding on and off. 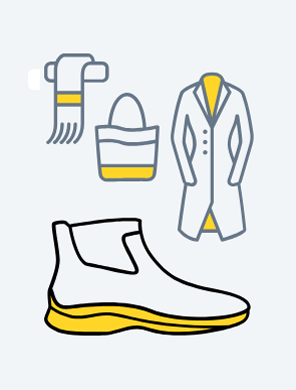 BEST ANSWER: With laces loosened, sliding the shoe on or off is not difficult. Nice snug fit. It's a little difficult, yeah. But nothing a shoe horn won't solve. Are these good for long walks, like touring Europe? BEST ANSWER: They are well made and very comfortable for walking, working out at the gym, etc. However, they are most definitely a shoe for fair weather (warm, dry, etc). I dont think they would be comfortable to wear in snowy or rainy conditions. Haven’t taken any long walks yet. But if you want a comfortable walking shie, the ZEROGRAND Wingtip Oxford is a great walking shoe. Walked all over Italy and Greece with them for two weeks. Lightweight and very comfortable. I have used them on 3to 4 mile walks on city streets and they were very comfortable. They are extremely comfortable for long periods of time. Great support. Yes is very confortable, you can use for walking or for training. how rigid is the bottom sole of the shoe? I need something with a thick stiff sole. BEST ANSWER: This is a fashion shoe created in the Hiker style. The sole is durable, but bendable. For dedicated hiking, you should look at a specialty hiking shoe.